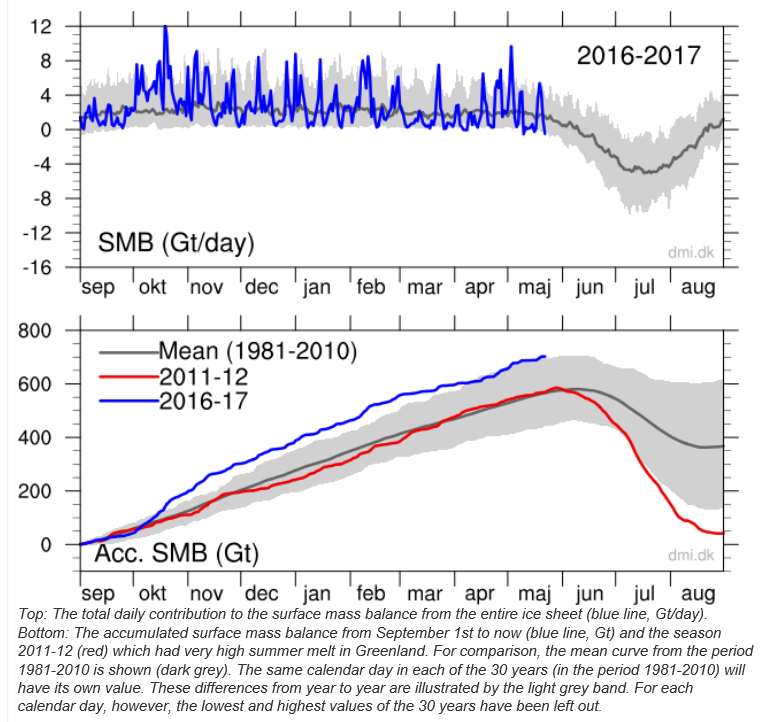 The vast majority area of Greenland has seen surface snow and ice gain over the past 9 months. 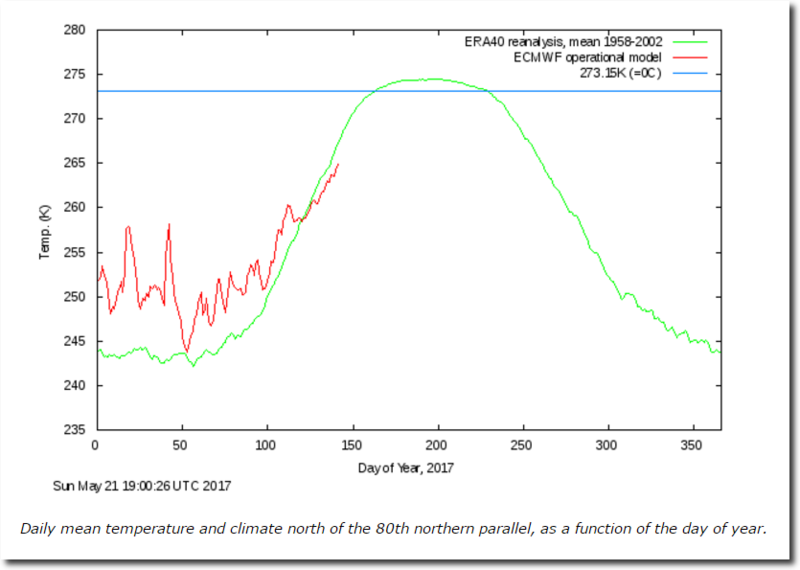 Moreover, Arctic temperatures for now are below normal. Winter snow and ice cover trend for the Northern Hemisphere has in fact been trending upwards since statistics started. And when one applies the 30-year weather mean used to define climate, the winter trend since 1987 is strongly upwards. So is the autumn trend. This 2017 winter was well above average, ranking in the top 10. The vast majority area of Greenland has seen surface snow and ice gain over the past 9 months. Moreover, Arctic temperatures for now are below normal...The big development in recent Arctic news is the “recovery” of Arctic sea ice extent, which now is back in the normal range. Polar snow and ice cover rarely cooperates, no matter what side of the warming issue you may be on. It changes so fast. When ice cover climbs, skeptics like to claim that it shows global warming isn’t what it is often hyped up to be. And when ice cover drops to satellite era record lows, the alarmists start screaming and hollering, forgetting that low ice levels were not uncommon in the past 100 years. 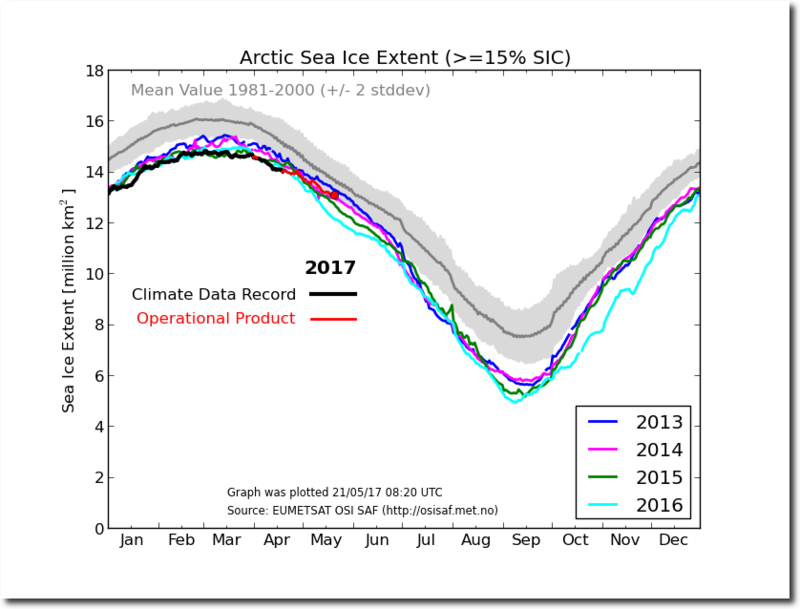 They freaked out just some months ago when the yearly autumn Arctic sea ice recovery faltered and fell to “record” lows. Immediately they began predicting near ice-free conditions for the coming summer. Just as the weather does, polar ice and snow cover also acts unpredictably, and now just a few months later Northern Hemisphere snow and ice cover is back within the normal range. 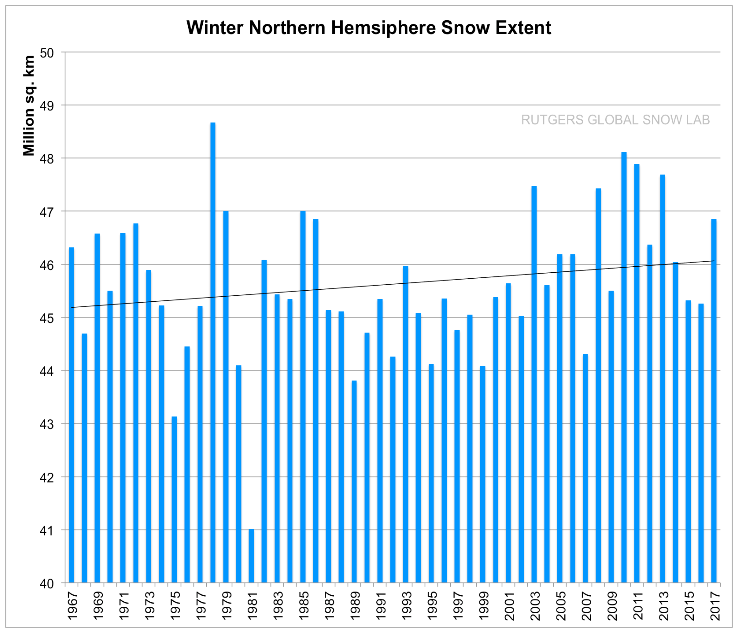 Winter snow and ice cover trend for the Northern Hemisphere has in fact been trending upwards since statistics started. And when one applies the 30-year weather mean used to define climate, the winter trend since 1987 is strongly upwards. So is the autumn trend. This 2017 winter was well above average, ranking in the top 10. As meteorologist Joe Bastardi, said, it’s going to take a fair amount of warmth to make the added ice go away again. The following chart shows the changes since Sept. 1, 2016. The big development in recent Arctic news is the “recovery” of Arctic sea ice extent, which now is back in the normal range. Quoting in part Mark Twain, reports of its death “have been greatly exaggerated”. Just months ago, alarmists were claiming an irreversible death spiral. Depending on Arctic weather conditions later this year, anything is possible as to what the Arctic does over the coming months. One thing is sure: Its death has long been exaggerated.